Welcome to my art! Here you can view and purchase some of my paintings not seen elsewhere on the internet. Also here are some recent items in my personal art journey: Miss. Light Festival, Miss. Museum of Art, Jackson, Feb. 2017. Miss. Artists Guild show, April-May 2017, Spectacles in Highland Village, Jackson, Hon. Mention for Wagon Waiting. Sold at Art on the Rez show, St. Peter Episcopal Church, Sept. 30, 2017. Arts Day at the Capitol, March 2018. Another sale at Art on the Rez show 2018. Pinelandia Art Gallery, Philadelphia, MS, four paintings Apr.23-May 7, 2016. Park Art Fair International show in Triberg, Germany, mid-March 2016. My painting: Male Dancer-I. Dec.2015-Feb.2016:MS Artists Guild Show, Spectacles:Pearl River at Jackson and Miss.River:Delta. Sept.-Oct. 2015: MS Artists Guild show, Jackson Museum of Art,N. State St.:Along the Trace, Street Musician. October 2014: Hon. Mention in MS Artists Guild, "Reservoir Botanical Gardens-I", watercolor, Spectacles in Highland Village, I-55 North, Jackson, MS. Thanks to the person who bought it! June 2014: Eight paintings in Art Center of MS , Jackson, show of Southern Artists Alliance . 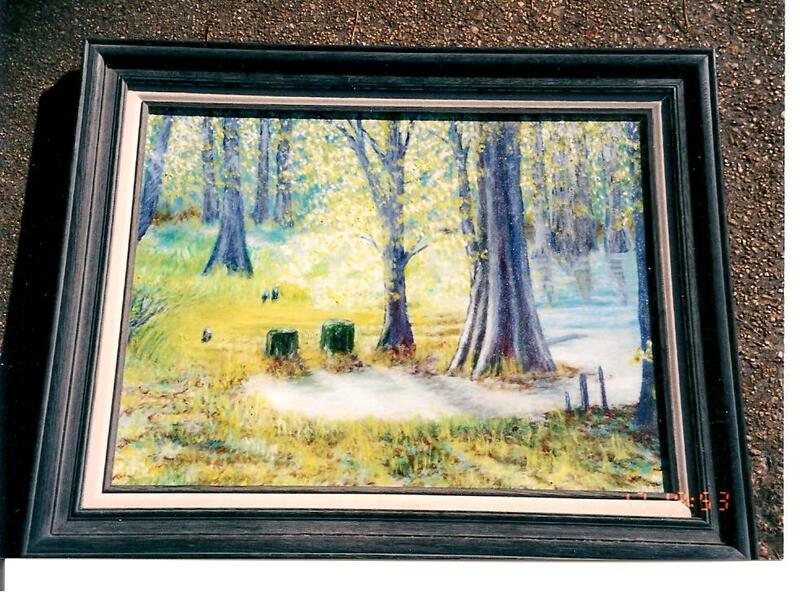 May 2, 2014: St. Richards Church, Jackson, MS. All May: MS Artists Guild show at Jackson, MS . Mistletoe Marketplace 2012 and 2013: At MS Trade Mart, High Street, Jackson, MS. Oct . 2012: Hon. Mention ribbon in MS Artists Guild, "Reservoir Botanical Gardens-II." Arts Center of MS. July 17-Aug.31, 2012: Blame It On the Blues show, Arts Center of MS.: "American Music: the Blues".Entire show transfer to B.B. King Museum, Indianola, MS., January 2013. Thanks to Cups County Line Rd., Ridgeland, MS, Dec. 1 2011-Feb. 28, 2012. Great show!Painting in Miss. Artists Guild Show, Art Center of MS., May 12-June 30, 2011,Jackson: Tropical Waterfall.2nd place in acrylics.Juried into the "100-Alumni" art show at U.Southern MS, Hattiesburg, MS, Oct.21-Nov.20, 2010.Juried into "Just Dance" exhibit of art in mid-June, 2010, with IBC competition, Jackson, MS. My painting was "Male Dancer-II".July 2009: Mississippi Artists Guild juried show, 3rd place ribbon in Acrylics for Grand Canyon Sunset, show at Arts Center in Jackson, MS next to the Planetarium. Also Garden Path in watercolor. See the Photo Gallery for house portrait commissions. [email protected] is my email.All my work is copyrighted. All rights reserved. This painting is Baldcypress Swamp. It is 18x24 oil plus frame, varnished. $175 price includes shipping.